I picked these up on a whim the last time I was at Whole Foods – because they were right next to the Field Roast sausages, so I assumed they would be delicious by association. And since my roommates and I had a barbecue out on our patio last weekend, it was the perfect chance to try them out. 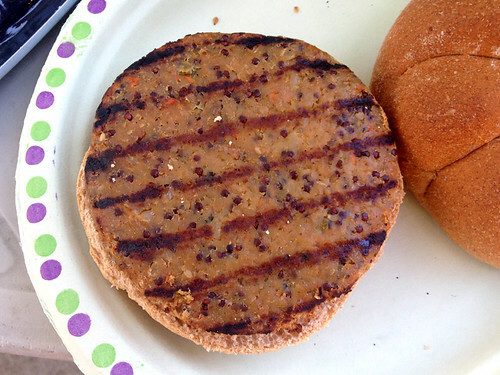 Those are not real grill marks – if you look at the prevous photo, you’ll see that the burgers come with painted-on grill marks. 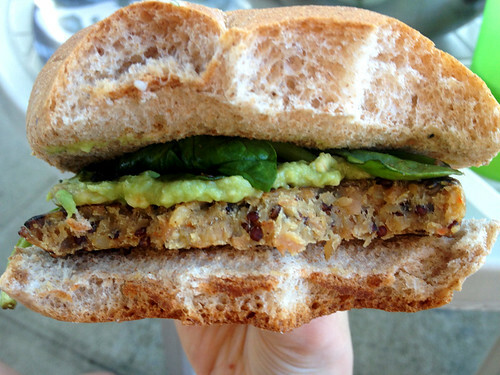 But these vegan, grain-based patties did cook up pretty well on the grill! They are quite firm, and held together just fine. Even flipping them over wasn’t an issue (although I brushed a little olive oil on them just to prevent sticking). They got a little bit dried out on the grill, but they were pretty dense to begin with anyway. 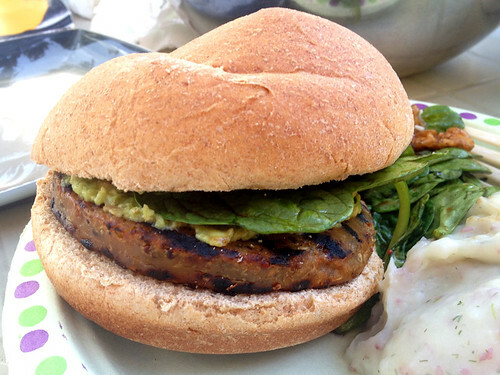 Neither the soft, crumbly texture of homemade veggie burgers, nor the stringy faux-meat texture of some store-bought patties, these burgers were actually more like the texture of vegan sausages. The teriyaki flavor was nice, not overly sweet or spicy, but a pleasant taste. I didn’t want to mask it with too many condiments, but since the patty and bun were kind of dry on their own I added some guacamole and greens. One of my roommates is also a vegetarian, so she ate the other patty that came in the package of two, and proclaimed it quite tasty as well. 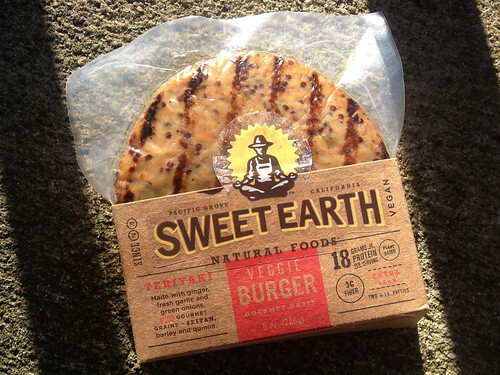 Although the teriyaki burger was the only flavor that Whole Foods had when I was shopping, I looked on Sweet Earth Natural Foods’ website and saw that they also make a santa-fe veggie burger and a za’atar flavored veggie burger. I love za’atar seasoning, so I will definitely try that one if I ever find it locally! They also make a bunch of flavored seitans, which I have not noticed in stores yet but I would be curious to try as well. Has anyone else tried this brand? What flavors, and what did you think of it?